Eur-Usd correlation with both pairs USD/CHF and NZD/USD is very strong as you can see from the figures 1 and 2 below. EUR/USD holds positive correlation with NZD/USD in an hourly time frame ONLY while it establishes strong negative correlation with USD/CHF pair both in an hourly and daily time frame. 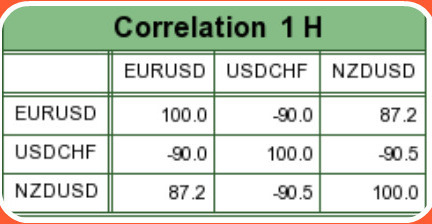 From figure 1, one can see Eur-Usd holds a strong negative correlation both in an hourly and daily time frames with USD/CHF pair. The correlations between these pairs hold at -90% and -95.4% in an hourly and daily time frames respectively. So how can I make use of these correlation information in making a profitable trading decision? That's a million dollar question I want to address here. The correlation number in the figure 1 translate to - when EUR/USD moves up then USD/CHF moves down and vice versa. If I've taken a long position on EUR/USD taking another long position on USD/CHF will nearly eat away all my profit should the market move in my favor. Taking a EUR/USD long position and a short position on USD/CHF simultaneously translates to doubling the EUR/USD long position. The only difference will be the difference in pip amount between these two pairs. For a standard account (=100K per lot) these pip differences stand at $10/pip for EUR/USD and $9.67/pip for USD/CHF. Also from figure 1, one can see the correlation of Eur-Usd with NZD/USD pair is a strong positive correlation of 87% in an hourly time frame whereas on a daily time frame a weak correlation of 47% holds between these two pairs. These percentages translate to - when EUR/USD moves up then NZD/USD will likely move up in an hourly time frame and vice-versa. For instance, in an hourly time frame, if I am long on EUR/USD pair then taking another long position on NZD/USD pair would equate to adding another EUR/USD long position. However,in a daily time frame, since the correlation between the pair is weak, I can not predict anything with confidence as with an hourly time frame. Understanding these currency correlation have proven very beneficial in my trading experience. I hope responsible traders will invest enough time and energy to understand this quick and easy currency correlation concept.